The topic of creation in art receives only limited attention in aesthetics today but I think it’s an important one, so I’m very pleased to be able to discuss it at this conference. Intuitively, one would expect the topic to attract lots of attention from philosophers of art but somehow it seems to fall by the wayside. Later I’ll makes some very brief remarks about why I think that’s the case. I’d like to investigate this topic via the French art theorist, André Malraux – a name that may not mean a lot to you because his work has been neglected in recent times. But Malraux developed a very powerful theory of art which, among many other things, includes an explanation of what creation means in the case of art, an explanation that I shall try to describe as succinctly as possible. But our subject is art, so how does all this relate to art? Well, first of all, if man is dead, the aesthetic theories – the philosophies of art – that depend on the ideals of man in question are necessarily dead too; and this is no small matter. The aesthetic theories that depend on Enlightenment notions of man are those of major figures such as Hume and Kant – theories that explain art in terms of familiar notions such as “judgement of taste”, “aesthetic sense”, “aesthetic pleasure” and so on. And the philosophies of art born of 19th century concepts of man are those that argue that art is tied in some systematic way to processes of historical change – which means the theories of such prominent figures such as Hegel, Marx, and Taine. If man is dead, those too are consigned to the archives of intellectual history. And along with all that, of course, go the many contemporary aesthetic theories – both analytic and continental – that still depend on these 18th and 19th century foundations. Thus, the consequences of the death of man in the field of art theory are severe, to say the least. The aesthetic theories of thinkers such as Hume, Kant, Hegel, and Marx, together with their modern descendants, are still of historical interest, but of historical interest only. So, if Malraux has a theory of art – and he certainly does – where does he begin. If, as he says, we today know that we do not understand man’s significance, what foundation does he build on when he describes the nature and purpose of art? In short, if man is dead, where to now? 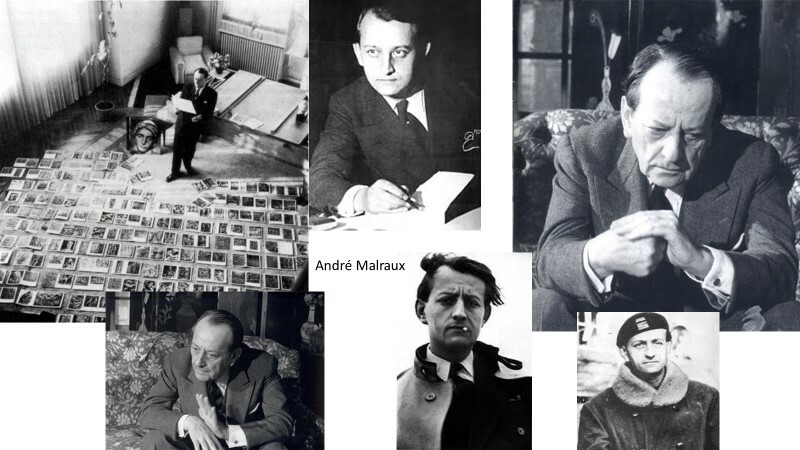 Malraux discovered a new way forward during a particularly dramatic experience in 1934 which laid the foundations for his thinking about art and for many other things as well. Unfortunately, time doesn’t permit me to describe the experience, but I can describe the thinking that resulted. Malraux found no answer to the question: What is man? On that score he remained an agnostic – like most of us today, he believes. But he discovered something more fundamental: he discovered the primordial human capacity to pose the question at stake. He discovered what he terms “the fundamental emotion man feels in the face of life, beginning with his own” and that emotion, he argues, is inseparable from the questions: “Why is there something rather than nothing?” and “Why has life taken this form?” This fundamental feeling of estrangement and perplexity, Malraux argues, is at the root of human consciousness itself. It is, simultaneously, an awareness of the world as a chaos of fleeting appearances and of the possibility of resisting that chaos; it is an awareness that everything, including man and all his endeavours, seems to be without the least significance, but at the same time an awareness of the possibility of conferring significance on man and his endeavours. In short, Malraux discovered the fundamental human capacity to call the world into question: a capacity, if not to understand man’s significance, at least to ask that question and, in so doing, to be more than a blind victim of meaninglessness and chaos. This discovery gave Malraux the answer to two crucial questions. It explained the nature of an absolute, and it also explained the fundamental nature of art. An absolute, he argues – such as a religion or even a powerful secular ideology – reveals an underlying unity beneath the chaos of fleeting appearances; it provides a definitive answer to the questions: “Why is there something rather than nothing?” and “Why has life taken this form?” A Christian, for example, might answer that the world is the way it is because it is the will of the Creator God; a secular ideology might answer that the underlying meaning is to be found in History – with a capital H – which is moving towards an ultimate goal, such as a classless society. And, of course, there have been many other responses. Then what is art? Art, Malraux replies, also replaces chaos with unity but, unlike an absolute, it gives no definitive answers. Art responds to the same fundamental emotion I have described, but it does so by creating another world, a rival world, not necessarily a supernal world, or a glorified one, but nevertheless a unified world – constructed solely of elements that, are the way they are, and are present, for a reason. Art, Malraux writes, creates a world “scaled down to man’s measure”. It “wrests forms from the real world to which man is subject and make them enter a world in which he is the ruler”. All this may seem rather abstract – and it inevitably is, because I’m dealing with fundamental issues. Nevertheless, we see at once that the foundations of Malraux’s theory of art are very different from those of traditional aesthetics. There is no presumption, for example, that man is endowed with a certain “human nature” which includes an “aesthetic sense” or a “sense of taste” – both central Enlightenment beliefs. There is no presumption that man is a creature of historical circumstance and that History is moving towards a knowable goal. There is, in short, no absolute that establishes man’s significance; there is only the basic capacity, lying at the heart of human consciousness itself, to call creation into question, a capacity to which art gives a series of answers, none of them definitive. Art, Malraux writes, is “a series of provis­ional responses to a question that remains intact”. Now, abstract though they are, these propositions give Malraux the basis for a comprehensive theory of art covering a range of major issues, one of which is the nature of artistic creation, the issue to which I now turn. According to one familiar view, which I’m sure you’ve all encountered, the impulse to be an artist – the basic desire to paint, to write, or compose music – springs from a response to some aspect of what is variously called “the world around us”, or “reality”, or “life” – such as a picturesque scene in the case of a painter, an interesting person or incident for a writer, and perhaps a certain sequence of everyday sounds for the composer. Viewed in this light, the artist is first and foremost a person who reacts to “the world around him” or “reality” in an unusually sensitive way, and then has an urge to respond through some form of artistic expression. The basic assumption is that the desire to be an artist, whether one succeeds or fails, springs essentially from a response to people, objects and incidents – to “the world”, “reality” or “life”. that, when explaining how his vocation came to him, every great artist traces it back to the emotion he experienced at his contact with some specific work of art: a writer to the reading of a poem or a novel, or a visit to a theatre; a musician to a concert he attended, a painter to a painting he once saw. Never do we hear of one who became an artist by suddenly, out of the blue, so to speak, responding to an impulse to express some scene or startling incident. Not surprisingly then, Malraux rejects the familiar view that the artist is essentially the man or woman who is “more sensitive to life” than others, and that the urge to become an artist results from this sensitivity. “An artist is not necessarily more sensitive than an art-lover,” he writes, “and is often less so than a young girl”. The artist, however, has a sensitivity “of a different order”. He or she is sensitive above all to art: “Just as a musician loves music and not nightingales, and a poet poems and not sunsets, a painter is not primarily a person who is thrilled by figures and landscapes. He is essentially one who loves pictures.” There is, in other words, no necessary correlation between “being sensitive” in the everyday sense, and being an artist; and just as the supremely gifted artist is not necessarily unusually sensitive in that everyday sense, so, Malraux argues, “the most sensitive man in the world is not necessarily an artist”. 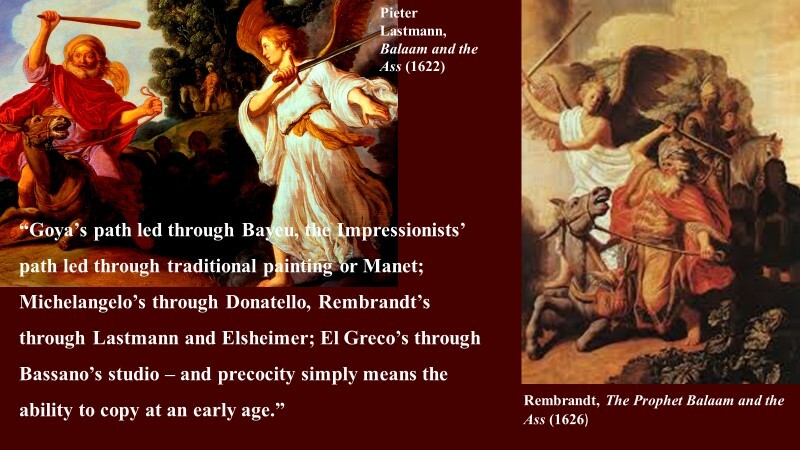 Goya’s path led through Bayeu, the Impressionists’ path led through traditional painting or Manet; Michelangelo’s through Donatello, Rembrandt’s through Lastmann and Elsheimer; El Greco’s through Bassano’s studio – and precocity simply means the ability to copy at an early age. Genuine artistic creation – as distinct from the pastiche – occurs only when the artist senses that copying no longer suffices. No longer content with imitation, he begins to see, Malraux argues, that he is a prisoner of a style, and that speaking in someone else’s language “involves a servitude peculiar to the artist: a submission to certain forms and to a given style”. Gradually glimpsing the possibility of a different unified world that he or she might bring into being, the artist starts to break free from the styles that had initially exerted such a powerful influence and begins, often haltingly, to develop another. Thus “it is against a style that every genius has to struggle”, Malraux writes; and “Cézanne’s architecturally ordered landscapes” (for example) “did not stem from a conflict with trees and foliage, but from a conflict with painting as he knew it”. is not the intensity of his responses to the world around him, nor only the intensity of his responses to the works of other artists; it is the fact that he alone, among all those who are fascinated by these works, also seeks to destroy them. This claim, initially puzzling though it seems, flows necessarily from the basic propositions we have considered. If, for the artist, bare “reality” or “the world around us” is merely the chaos of fleeting appearances, the painter (or composer or poet) has only two choices: to “copy another painter – or to make discoveries”: to follow an existing path or to blaze new trails. Thus, in fulfilling a desire to create – to emulate the achievements of the artist or artists he most admires – the painter, composer or poet must therefore, paradoxically, eradicate from his own work all trace of the styles of those very artists. That is, in bringing a new, unified world into being, he must struggle against and eventually destroy, in his own work, the very styles that elicited so much admiration and gave birth to the desire to be an artist in the first place. There is no middle way, so to speak, – no neutral path, such as a “styleless” representation of the world, in which the artist might take temporary refuge. The options are simply the pastiche or discovery – to copy or to blaze new trails. The proposition that there is no such thing as a “styleless” representation of the world raises another issue we shall consider in a moment. This, however, is a good place to pause and consider a possible objection to the points made so far. can be rich in suggestions – of colour, of line, and of the form the artist “is after” – for the artist who is looking for them, and on condition that he is not looking for them as for a pre-synthesised whole but in the sense that great wellsprings, their levels having built up, look for a watercourse to follow as a river. Under these conditions, the part played by living forms can be immense; a vast “dictionary”, to borrow Delacroix’s term, will emerge out of limbo. 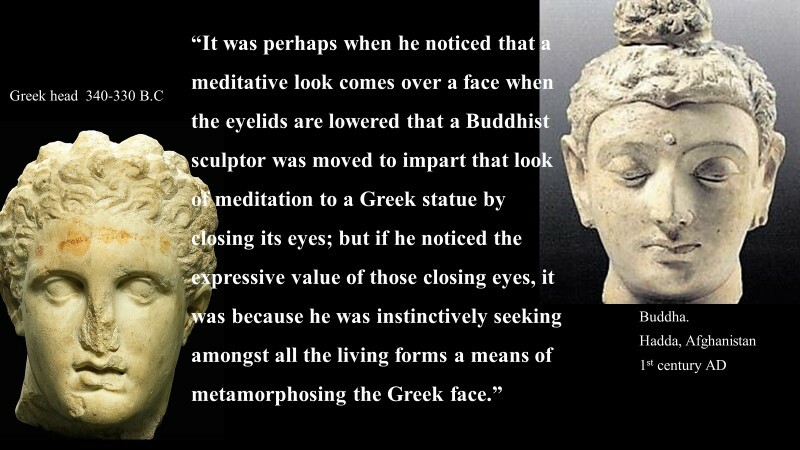 It was perhaps when he noticed that a meditative look comes over a face when the eyelids are lowered that a Buddhist sculptor was moved to impart that look of meditation to a Greek statue by closing its eyes; but if he noticed the expressive value of those closing eyes, it was because he was instinctively seeking amongst all the living forms a means of metamorphosing the Greek face. Here, if I may, I’d like briefly to return to Malraux’s claim, mentioned earlier, that the artist has only two options: to “copy another painter – or to make discoveries”: to follow an existing path, or to blaze new trails. This proposition, we recall, arose from his argument that the artist begins with the pastiche and that, in bringing a new unified world into being, must struggle against, and eventually destroy, the style or styles that had originally impressed him and given birth to the initial desire to be an artist. On Malraux’s account, as we saw, there is no middle way – no intermediate position, such as a “styleless” representation of the world, in which the artist might take temporary refuge. Now, in response to this, one might perhaps argue that Malraux is giving an unduly restricted account of the artist’s options. Surely, one might say, there are other alternatives apart from, on the one hand, the style of some previous artist (or some combination of more than one existing style), and on the other, a new style that the artist himself has discovered? Surely, there is some “extra-stylistic” option – a “neutral” position, so to speak, that can, at least temporarily, provide another path? that there exists a styleless, photographic kind of drawing (though we know now that even a photograph has its share of style) which would serve as the foundation of a work, style being something added. No such copy has ever been made. 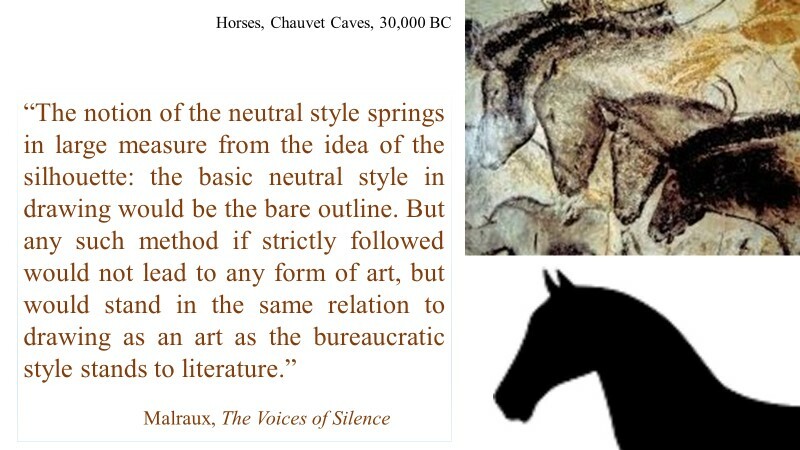 Even in drawing this notion can be applied only to a small range of subjects: a standing horse seen in profile, but not a galloping horse … Can one imagine a drawing of a rearing horse, seen from in front, in a style that is not that of any school, or of any innovator? springs in large measure from the idea of the silhouette: the basic neutral style in drawing would be the bare outline. But any such method if strictly followed would not lead to any form of art, but would stand in the same relation to drawing as an art as the bureaucratic style stands to literature. The reasoning here flows directly from the account of art we have been examining. If, for the artist, “the world around us” is at most a “dictionary” – an assemblage of elements combined in a manner that renders them incoherent – and if the artist replaces this with a rival, unified world, creation in art will always involve a process of selection, exclusion, and re-ordering – in short of transformation. A “neutral style” – that is, a procedure which, in the name of a supposed “objectivity” or “absolute realism” refused to transform – would thus not be a “styleless” art but no form of art at all. It would simply be an abandonment of the processes on which art necessarily depends. Here we see how far Malraux’s understanding of art differs from the popular view that art is essentially a form of representation. This familiar idea, which is often invoked in the case of visual art and literature (though less so for music) fosters the belief that the art is essentially a kind of “transcription” of the outside world onto the surface of a canvas or into the pages of a novel. From there, it is but a short step to suggest that a neutral style, which would transcribe reality with minimum stylistic “interference”, or even none at all, would be a possibility. Malraux’s analysis implies that this line of thought rests on a fundamental misunderstanding. To the extent that it is even conceivable, a neutral style would be a form of depiction that had abandoned all but the last vestiges of the procedures available to art. In visual art, it would result at best in the bare outline or the silhouette. In literature, it would lead to the commercial or bureaucratic style where, similarly, language tends towards a limited range of standard, “lifeless” forms. To the extent it were possible, a neutral style would, in other words, lead merely to the sign – that is, to those limited uses of visual forms or language that merely suggest, or “point to”, living forms (as a silhouette of a standing horse might be used to indicate the presence of horses) but it would stop well short of portraying any such form. The artist, Malraux is arguing, is not involved in transcribing anything, but in transforming. Certainly, representation, in the simple sense of including in a picture forms resembling real objects, is one of the tools or techniques available to art – like the varied uses of line or colour – but, on Malraux’s account, it is no more than that. As a form of endeavour – as a human activity – he is contending, art is never representation. Art is the creation of a rival world, a world that depends for its existence on a process of transformation of “the world around us”. “We are beginning to understand,” he observes, “that representation is one of the devices of style, instead of thinking that style is a means of representation”. “Great artists,” he writes, summing up this view, “are not transcribers of the world; they are its rivals”. It follows from all this that, for Malraux, the true work of art is a creation in the full sense of the term: it is something that seems to emerge “out of nowhere”, a creation ex nihilo. This is not to deny that in practice the process of artistic creation is often preceded by a laborious apprenticeship, and Malraux himself writes that “frequently the artist has to expel his masters from his canvases bit by bit; sometimes their hold on him remains so strong that he seems, as it were, to insinuate himself into odd corners of his picture”. That said, however, the true work of art is a creation ex nihilo because its achievement depends on the complete destruction of the style or styles from which it originated, with no intermediate position – no neutral position – to occupy. It’s for this reason that Malraux has so little enthusiasm for accounts of the history of art that are, to use his words, “only chronologies of influences”. For Malraux, art, as distinct from the pastiche, begins precisely where influences cease. While acknowledging that every artist begins by imitating, and that influences in this sense are the crucible out of which art emerges, he is claiming, nonetheless, that only when those influences have been eradicated does art comes into being. A history of art that spoke of artistic creation solely in terms of influences – either on, or by, the art it describes – would, for Malraux, speak of everything except the essential. I said at the beginning that I would say a few words about why the topic of creation receives relatively little attention in modern aesthetics but I’ve left myself so little time I’ll need to keep my comments very short. In essence, creation fares badly, in my view, because the two major sources of modern aesthetics – Enlightenment thought and nineteenth century thinkers such as Hegel and Marx – felt their prime concerns lay elsewhere. Enlightenment thinkers regarded art as a given – it was simply part of the human landscape they set out to explain – and the only question that mattered was how art could be linked up with the models of human nature they were developing. Hence the focus on ideas such as aesthetic sense, a judgement of taste, aesthetic pleasure and so on. For Hegel and his intellectual descendants, the situation has been similar, with the important difference that the idea of human nature they had in mind now included the role of history. Again, however, art was essentially a given – part of the human landscape – and the focus lay not on what creation might mean in the case of art, but on explaining the relationship between art and history. The relative lack of interest philosophers of art show in artistic creation today is, I think, a consequence of this historical inheritance. Modern aesthetics is heavily indebted to its 18th and 19th century forbears – more so than it often likes to admit – and this not only affects the way it thinks, but what it thinks about – and doesn’t think about. Creation is art is a good example. It was not high on the agenda before, and it still isn’t now. For Malraux, by contrast, art is not simply a given; he explains its very existence. Hence the important role creation plays in his thinking. André Malraux, La Tête d’obsidienne, (Paris: Gallimard, 1974), 221. All translations from French sources are my own. André Malraux, “Articles de ‘Verve’: De la représentation en Occident et en Extrême Orient,” in Ecrits sur l'Art (I), ed. Jean-Yves Tadié (Paris: Gallimard, 2004), 931-940, 933. Les Voix du silence, 539. Les Voix du silence, 887. In the case of music, the logic is sometimes abandoned and it is suggested that a composer is inspired by scenes or events rather than sounds. This perhaps reflects an uncomfortable feeling that a sequence of everyday sounds seems an unlikely origin for a symphony or concerto, for example. As Malraux puts it (also commenting on the conventional view), “A composer seems less likely to have become one out of a love for nightingales than a painter to have become a painter out of love for landscapes.” Les Voix du silence, 502. Ibid., 497. Malraux also neatly encapsulates the point in a comment on the well-known legend about Giotto. “An old story goes,” he writes, “that Cimabue was struck with admiration when he saw the shepherd-boy, Giotto, sketching sheep. But, in the true biographies [of artists], it is never the sheep that inspire a Giotto with the love of painting, but rather the paintings of a man like Cimabue.” Les Voix du silence, 497. Cf. “No shepherd became a Giotto by looking at his sheep”. L'Homme précaire et la littérature 125. Les Voix du silence, 494. Francisco Bayeu (1734-1795), one of Goya’s early teachers and mentors. Les Voix du silence, 526. In a similar vein, Malraux writes in L’Homme précaire et la littérature: “Rimbaud did not begin by writing a kind of vague, formless Rimbaud, but with Banville; and the same is true, if we substitute other names instead of Banville, for Mallarmé, Baudelaire, Nerval, Victor Hugo. A poet does not begin with something vague and formless but with forms he admires.” L'Homme précaire et la littérature 155. Les Voix du silence, 582. The idea can, however, be exaggerated. One early critic argues that for Malraux “the artist … is essentially demonic, and his demonism is directed against the forms of his predecessors, which he is trying to devour…” John Darzins, “Malraux and the Destruction of Aesthetics,” Yale French Studies 18 (1957): 108. This distorts Malraux’s point. Ibid., 570. As he acknowledges, Malraux is borrowing the term “dictionary” in this sense from Delacroix. (See Les Voix du silence, 570.) The thinking here is not limited to visual art. In L’Homme précaire et la littérature, Malraux uses the same concept of a “Delacroix’s dictionary” in the context of an analysis of literary creation. L'Homme précaire et la littérature 157. Les Voix du silence, 573. Cf. “Whatever he might say, [the artist] never submits to the world, and always submits the world to that which he substitutes for it. His will to transform is inseparable from his nature as artist.” André Malraux, La Psychologie de l'art: La Création Artistique (Paris: Skira, 1948), 156. Emphasis in original. Ibid., 698. Emphasis in original. Malraux uses this same statement as the epigraph to his final volume on art, L’Intemporel. Cf. also: “Like the painter, the writer is not the transcriber of the world; he is its rival.” L'Homme précaire et la littérature 152. Les Voix du silence, 570. Ibid., 879. Cf. “The history of art is the history of forms invented in place of (“contre”) those inherited.” Ibid., 582. This is a paper I gave at the annual conference of the Australasian Society for Continental Philosophy at Deakin University, Melbourne, 7- 9 December 2016. The aesthetic theories of thinkers such as Hume, Kant, Hegel, and Marx, together with their modern descendants, are still of historical interest, but of historical interest only. Art creates a world “scaled down to man’s measure” It “wrests forms from the real world to which man is subject and make them enter a world in which he is the ruler”. The painter, in other words, is first inspired by paintings, the novelist by novels, the poet by poetry, and the composer by music. In fulfilling a desire to create – to emulate the achievements of the artist or artists he most admires – the painter, composer or poet must therefore, paradoxically, eradicate from his own work all trace of the styles of those very artists. .... the “fallacy of the neutral style”. “We are beginning to understand that representation is one of the devices of style, instead of thinking that style is a means of representation”.